Courtney Love recently posted a screenshot to her Instagram account from Rolling Stone’s website which – on that same day – released its 50 Greatest Grunge Albums. Hole’s Live Through This came in at number four and almost 68,000 fans and followers liked that image, showering her with a barrage of hearts and congratulations in the comments. Lead vocalist Love, as well as guitarist Eric Erlandson, bassist Kristen Pfaff and drummer Patty Schemel crafted a 90s era-defining masterpiece that has been canonised on virtually every top music list of that decade. The raw, unapologetic honesty of the lyrics, brought to life by Love’s sweet yet deeply sinister vocals, makes the album unforgettable. The same could be said about the spine-tingling album cover image, shot by fashion world favourite, Ellen von Unwerth. 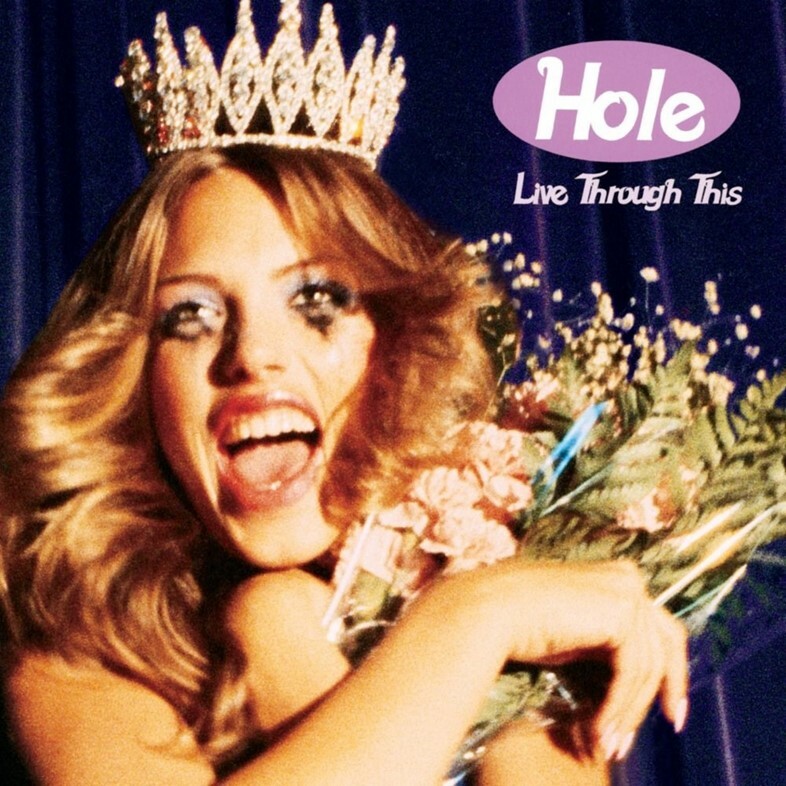 Hole’s second studio album, Live Through This was an anomaly at the time. Love and Erlandson wrote the songs and broached topics like feminism, violence against women, beauty, postpartum depression, motherhood, feelings of self-doubt and relationship woes. Love once openly admitted that she was competing with her husband, Kurt Cobain, during the making of the album. Though many critics alleged that Cobain had a hand in writing the album (he didn’t), his undeniable presence looms like a dark cloud over the album. He sang uncredited back-up vocals with Pfaff on Asking for It and Softer, Softest. With tragic timing, DGC Records slated the release date for Live Through This on April 12, 1994, seven days after Cobain committed suicide. Three months later, Love and the band suffered another blow when bassist Pfaff died of an overdose. Von Unwerth unknowingly captured the turbulence surrounding Live Through This in one frame. Bishop’s effusive, open-mouth expression on the cover album speaks volumes as loud as Love’s voice. Von Unwerth says, “I just had done several shoots with [Bishop] and really loved her cool rock and roll attitude.” But how did she evoke such reaction from Bishop? Von Unwerth admits, “This is what I do. It’s like being a movie director.” She also remembered being self-assured when she saw the selects after they had wrapped the shoot. “We all felt that we nailed it,” she says. And that she did. While Von Unwerth’s diverse portfolio features art from other bands’ album covers like Bananarama, Belinda Carlisle, Janet Jackson, Dido, Britney Spears and Rihanna, somehow Live Through This stands out as a chillingly authentic, visual interpretation of Hole’s music. Von Unwerth naturally connected the band to its fans through a harmonious mix of rock and roll attitude and highly stylised photographical prowess. 25 years on, Von Unwerth declares, “I am very proud that I was part of this album, this band, and this time in music and cherish every moment of it.” And if those “best of” lists are any testament to Von Unwerth’s work, Billboard – back in 2015 – placed Live Through This at number 12 in their 50 Greatest Cover Albums of All Time. It makes sense, after all, that Helmut Newton once referred to her as a gun for hire.